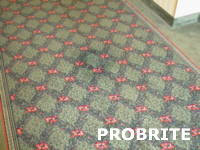 Welcome to Probrite.Net, website of the carpet color specialist in the upper-Midwest U.S.A.! 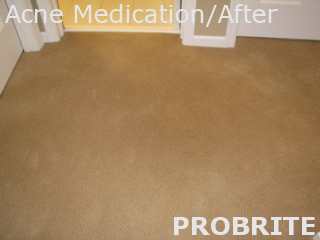 Our services include color repair, correction, change, enhancement, and color maintenance of carpet. We specialize in the problems that are widely considered impossible to correct and with replacement being the only option. 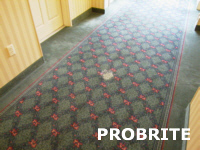 Since the early 1980s we have been successively and consistently solving color problems for all installed carpet installations, loose-lay and fine Orientals – regardless of fiber content. 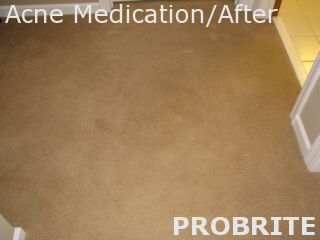 Nylons, acrylics, polyester, sisal, jute, cotton, wool, silk, and even olefin have all been successfully repaired and worked with. 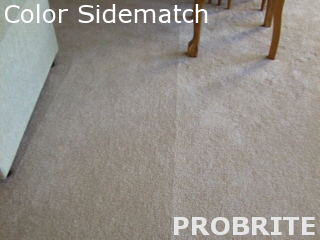 From carpet bleach stains (bleach spots), sun fading (sun bleaching), to carpet side match; all color related problems in carpet is our speciality. A master dyer and spotter can employ generationally proven arts and practices that go far beyond the abilities of common cleaning. Explore our website and be amazed at what can be done for the perceived impossible. 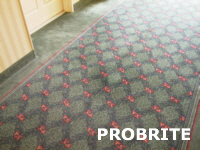 For decades we have been solving the most difficult problems related to carpet color. Whether the problems were related to bleaching to off-coloring, our services have extended locally to internationally. We specialize in the "impossible job". A large part of our business is providing troubleshooting and consultation for the cleaning professionals. Carpet color is our business, our only business! Carpet salespeople tell us that color is the number one consideration of a new carpet buyer. Yet, color damage is the number one cause of replacement. As many have noted, most carpets will ugly out long before actually wearing out. It is the addition and/or loss of color that causes most replacement. Color loss, yellowing, dye and ink stains, furniture stains, or bleaching from sunlight, chemicals, or traffic dye wear, are major forms of such damage. Whether the problem is thumbnail size, located in residential, or lage scale commercial, the vast majority are repairable. Virtually all common maladies, short of construction degradation, are either repairable or can be brought to an acceptable appearance level. Benzoyl Peroxide. A common ingredient found in many personal care and cleaning products. This oxidizing bleach usually shows up on clothing, towels, and carpet. 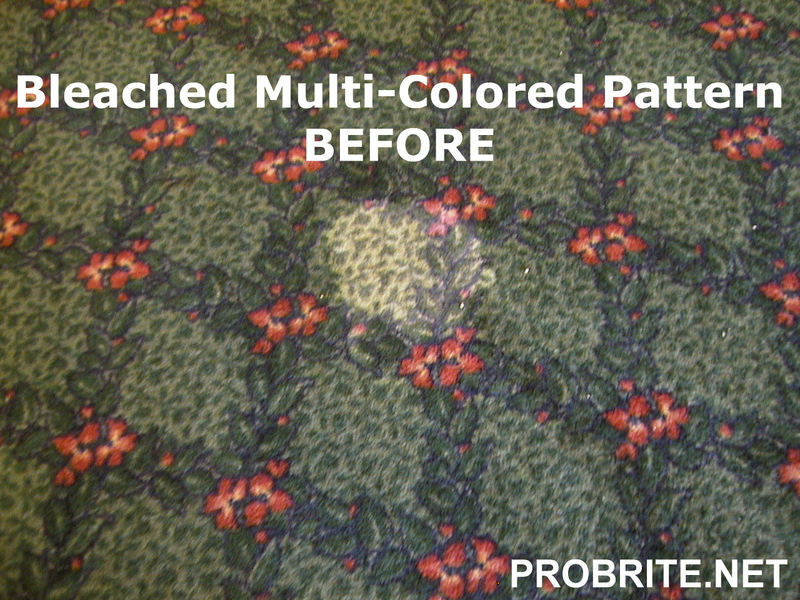 Classified as a latent color destroyer, it can remain dormant in carpet for months, until activated to cause color bleaching. 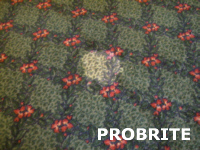 Carpet cleaning or high humidity are common triggers. Bleach Stains. 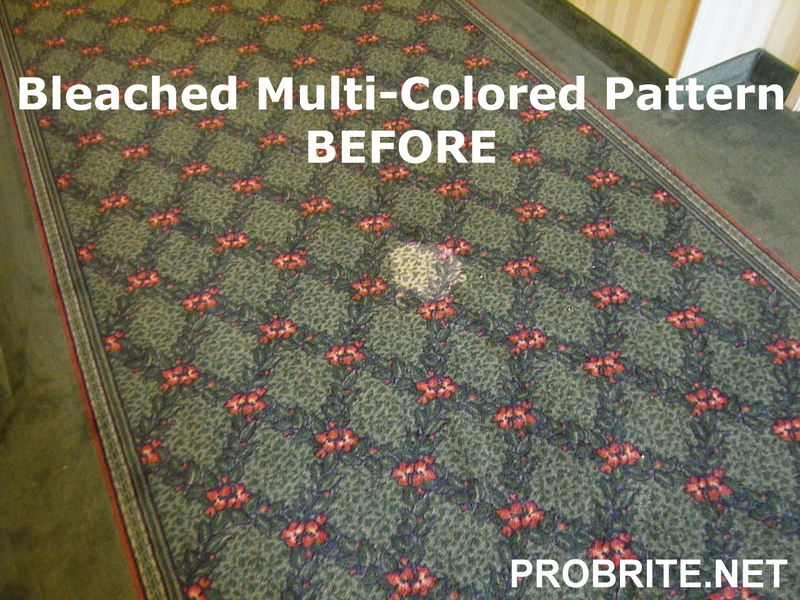 A myriad amount of carpet bleaching is caused by many ingredients in today's products. Chlorine, peroxides, color strippers and solvents, are only a few of the many color bleaching offenders. The vast majority of these chemically caused problems are repairable by redyeing. Dye & Ink Stains. Dye stains from writing inks to food dyes in drinks are usually correctable. Only a very few of these occurances are beyond repair. Fading. 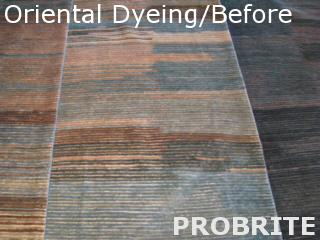 Loss of color due to sunlight, fumes, heat or traffic is reverseable with industrial quality dyes. 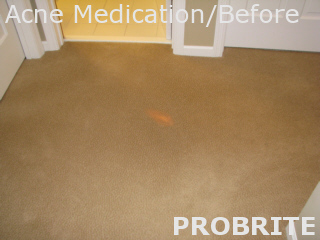 Redyeing of color faded areas or even an entire carpet gives beautiful results. Furniture Stains. 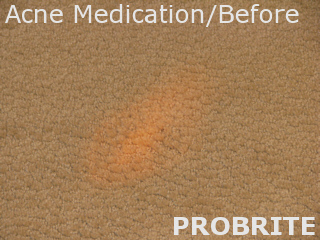 Wood stains from furniture on carpet can be removed without cutting and patching. Removing and possibly redyeing these color damaged areas usually produces far better results than using a knife. Pet Stains. Cats, dogs and other household pets are loveable, but can be center to carpet color headaches. These pet staining and bleaching problems do have remedies besides replacement. 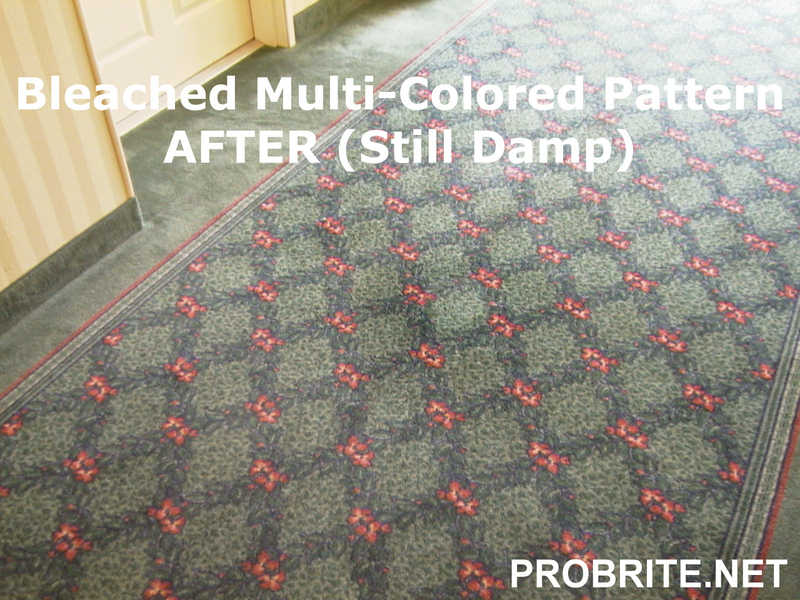 Repair Multi-Colors/Fibers and Patterns. There are a number of dyeing procedures that the master dyer can choose from to repair a specific problem. Where one procedure may work fine, another can actually cause additional damage. It takes knowledge, training, experience and good judgment to determine which path to follow in unusual circumstances. Repairing non-nylon or wool, multi-colors and patterns are examples that require such advanced dyeing. Textiles made from fibers such as polyester, rayon, acrylic, blends, or cellulosic fibers present their own specific hurdles. Repairing the design in an oriental rug that has a missing wing from a bird or a petal from an upholstered sofa's flower design presents other challenges. A basic rule of thumb is if a textile was originally colored during construction, if can be color repaired when necessary. However, it takes more than a professional. A professional is one that simple gets paid. An expert is one that knows what he or she is doing. In new carpet installation, some occasional manufacturing imperfections show up as off-sidematch at seams, banding, or steaks. Reinstallation has many times been the method used to correct the problems. However, this solution is not without its own drawbacks. Additional high costs of tear-out, site preparation and reinstalling are incurred. Further business disruption, and time delays are other issues that come into play. Plus, there is also the possibility that reinstallation of the same carpet line will face a repeat of the same problem. This can and does happen all too often  occassionally, multiple times on the same job. 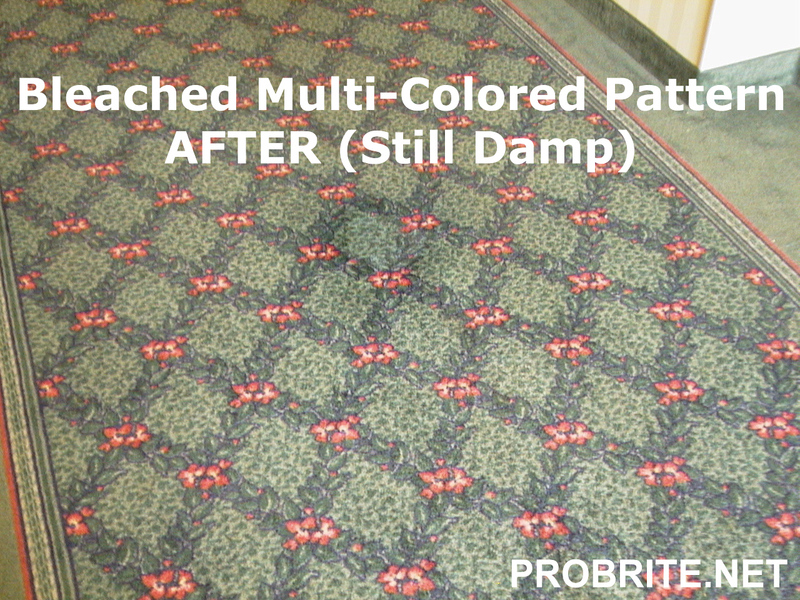 Carpet color correction is an alternative remedial solution. Using the same mill dyes and procedures, it extends the final manufacturing processes to on-location and is specifically tailored for each individual situation. 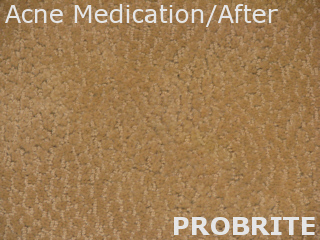 Extending the in-plant manufacturing processes to on-location, color correction is a final step in the manufacturing and installation of broadloom carpet. It preserves all warrantees and guarantees years of life and beauty for a major investment. 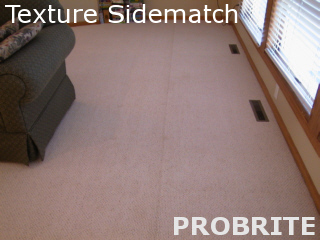 Color Sidematch - A color variation at the seam when two carpet panels are joined. This may affect the full length of the seam or only partially. It can appear that the panels have totally different colors, or are only slightly off. There are various causes for this to occur, but almost all of the situations are correctable onsite without reinstallation. 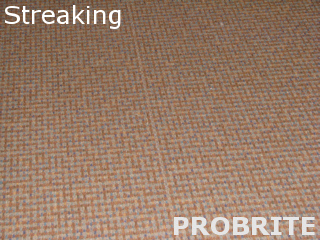 Roll Crushing of Carpet Pile - Not Considered A Mill Defect. 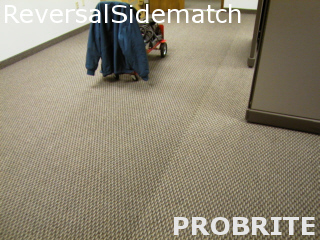 Pile Reversal - A pile reversal within a roll of carpet can occur during manufacturing, and when two pieces are seamed together a color difference will appear. A reversal is usually assumed to be cause by the carpet being turned different directions during installation, but this is many times not the case. For example, a pile reversal can be present even when the face fiber patterns match at the seam, and the stamps and arrows on the backing of both panels are self-consistent. Roll Crush - Pile crushing is not considered a manufacturing defect, even though it can give the appearance of a color difference at the seam. 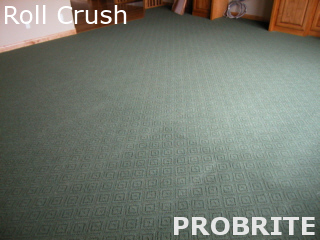 The crushing usually occurs during storage or shipping of the carpet rolls, and results with a variance of pile direction at the seam when installed. It can be corrected with little difficulty with vary rare exceptions. 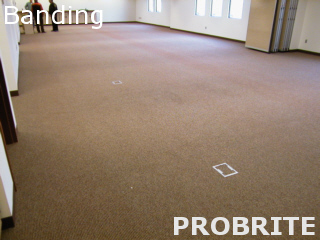 Banding - Bands of differing hue, value, width or number can occur that run the length or width of a carpet. The causes can be due to color, the lack of color, texture difference, or other variations that occurred during manufacturing. Streaking - This is usually observed as a narrow line or partial line running lengthwise in a carpet. 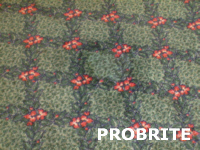 It can appear darker or lighter in color - or lack of color - in the carpet roll. Most often there is a single line in the carpet roll, but there can be more. This is a correctable situation, even in a multi-colored patterned carpet. Texture Sidematch	- During the shearing or tufting process of manufacturing a texture variance can cause the appearance of a color or shading difference. Shearing of random style loops can cause what appears as a color sidematch when panels are seamed together. In the crafts and trades there are many general rules written to keep the novice within safe parameters. Venturing beyond those borders has caused more than one's demise. 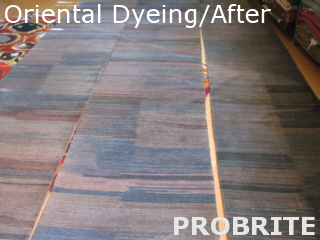 In on-location color repair and correction work there are very few master dyers. It has been estimated that their total number can be shown on a few hands  the actual number is unknown; but it is these artisans that write the rule books, that deal with the exceptions, and set the standards. They have learned  sometimes throught painful experience  which situations need "white kid glove treatment" and what boundries may or may not be pushed. Special Fiber Dyeing. A simple search of the internet will reveal a universal belief that only nylon and wool fibers may be dyed. Even some types of these may not  modified nylon being one. A few companies have advertised to the public that they could dye various other fibers on-location. Extreme skepticism towards those claims are highly adviseable! That type of speciality is not taught anywhere in the industry. So those claims are most probably bogus, or at the very least naive! With that being said; ALL textile fibers can have their color(s) enhanced and/or altered in varing degrees. The problem is not the coloring of fibers, it is the extending of what is possible in the mills to on-location applications. Dyeing two-left rugs(new) to match right-installed rug (different dye lot). Final result was a perfect match (without shadows). These photos are actual and have NOT been retouched! Special Color Projects.Occasionally, special projects arise that present unusual challenges. Most often these projects are the results of other unusual situations. An example of such is shown by the photos to the right. Here, an upscale home had an one-of-a-kind, handmade, specially dyed carpet that was inplace for a number of years. The owner then commissioned two new matching carpets to be made to join the original. After delivery, it was discovered that the two dyelots were noticeably and objectionlly different. Given the situation, had they been closer that would have been unusual and strictly by chance. The project was to make the two differing dyelots blend as a unit. Damaged Oriental Rugs.. Horror stories from owners of expensive oriental rugs commonly involve bleach, pets, sunfading or other color disfigurements. The vast majority of these situations have solutions for repair. 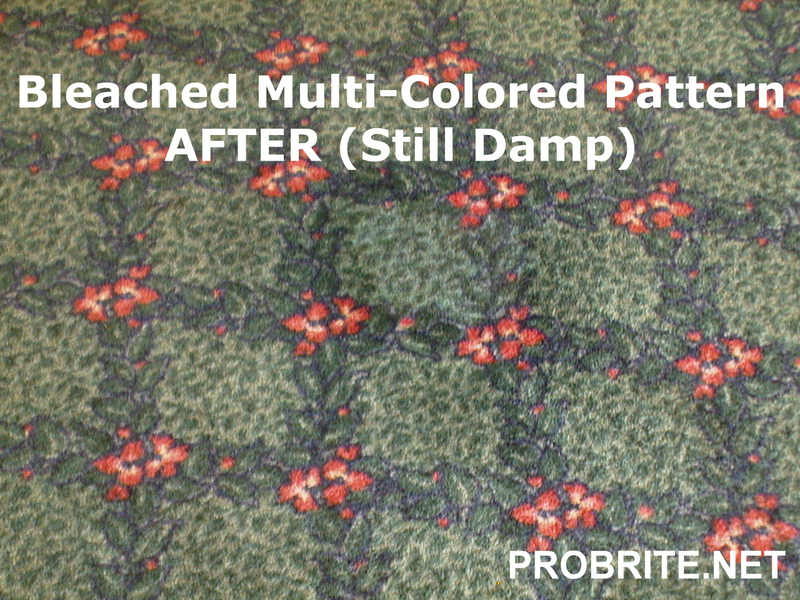 Bleached color patterns can be restored. Dye bleeding into other color can be removed. 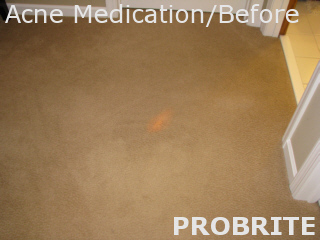 Yellowing from pet stains can be corrected. A master dyer should be consulted before giving up hope for color reconstruction. Usually, it's only actual fiber destruction that can stymie having recourse of some type. Color That Kills. Dye stains from myriad sources have "killed" many a textile; whether it be from the "sippy-cup" filled with red Kool-Aid or the medicinal yellow/orange dye staining from sulfasalazine. Damaged done from foreign dyes have caused the shedding of more than one tear. 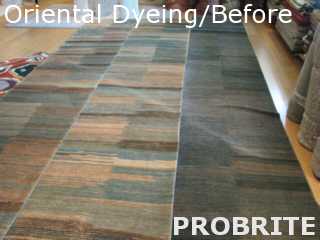 However, a master dyer, expert in the art of textile bleaching and redyeing, can remove and replace these offenders with the required corrective dyes for color restoration. 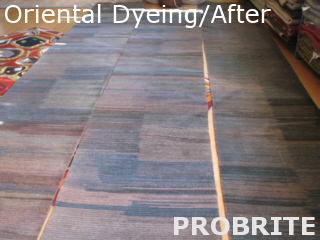 The all-too-common practice of replacing flooring textiles damaged from foreign dyes is an unwarrented, burdensome expense that need not happen. Call an expert before giving up. 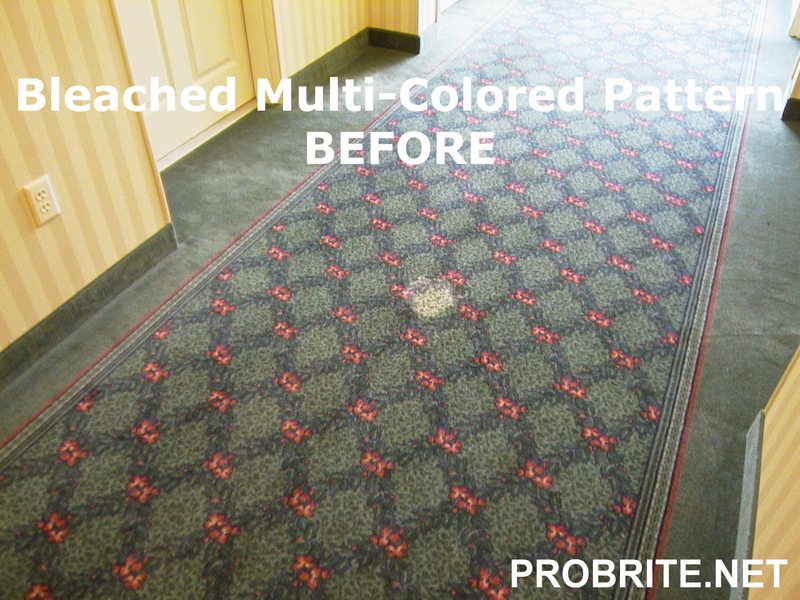 Our services include color repair, correction, change, enhancement, and color maintenance of carpet. Whoever has carpet color problems is our potential customer. We are well into our third decade of serving home owners, carpet mills, dealers, cleaners, businesses, and contractors - all with carpet color problems. That is what we do, all we do, and we do it well! That is why we say, "When the Pros Need Help - They Call Us!" 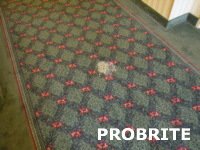 Carpet color problems arise from a myriad of different sources and reasons. Common complaints are chemical bleach, acne cream bleaching, sun bleaching or fading,cleaning products, furniture staining, Kool-Aid™, pets, fingernail polish, sidematch, roll-crush, and the list goes on. Whether the problem is thumbnail size located in residential or large scale commercial, the vast majority are repairable, or can be brought to an acceptable appearance level. We have received numerous inquires looking for help in distant locations. For most, the possiblilities for helping have been small. The size of the job rarely warrants the expense of a fly-in. As an alternative, we are offering this generic and targeted how-to multi-media training facility. With the proper training and guidance, some may be able to at least improve upon their own situation. home | resources | site map | legal | privacy statement | login Copyright © 2019. All Rights Reserved. We use Angie's List to assess whether we're doing a good job keeping valued customers like you happy. 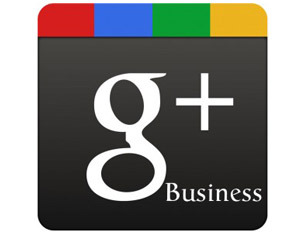 Please visit AngiesList.com/Review/8636758 in order to grade our quality of work and customer service.